Rampegolo, Antonio [Antonius Rampigollis]. 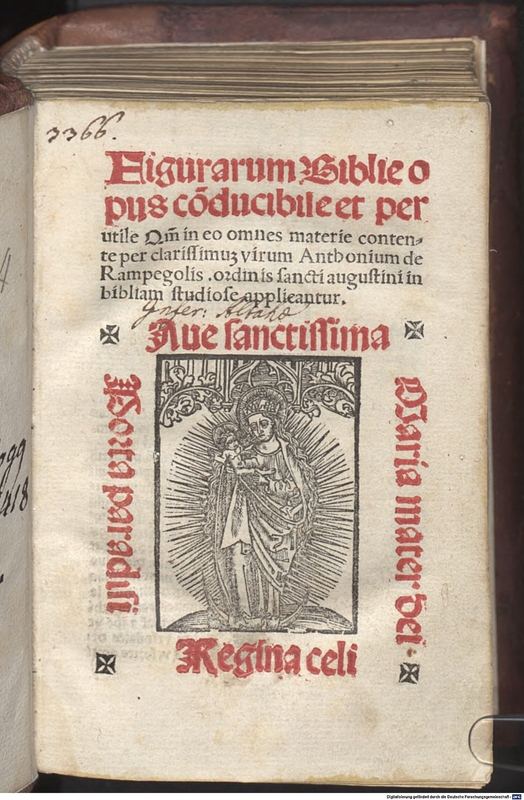 Figurarum Biblie opus conducibile et perutile. Cologne: [Cornelius von Zierickzee], 1511. Illustrated. The date given in the Sotheby catalogue is 1505, but we cannot find such an edition and have listed the 1511 edition instead. Provenance: Morris. — Richard Bennett. — Sotheby 1898, lot 819 (sold to Henry Wellcome for £4). — Henry Wellcome. — Wellcome Library [deaccessioned]. — Wellcome auctions (1), lot 226 (sold to Eiseman for £2 ). — Unlocated. Reference: Ellis valuation, fol. 7b, no. 81 (10s.) — MS catalogue (2), no. 981.